Hadrian's Wall Path (National Trail Guides) Hadrian's Wall Path National Trail is a footpath of some 81 miles (130km) linking Wallsend, near Newcastle-upon-Tyne, with Bowness-on-Solway on England's west coast. 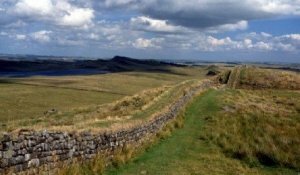 The Path will shadow, for its greater part, the historical line of Hadrian's Wall; it is the only National Trail to lie within a World Heritage Site, and there are many opportunities to explore the fascinating history of our four centuries of Roman rule. It is also a walk of dramatic contrasts, starting amid bustling, redeveloped Newcastle, where the Path passes Millenium Bridge and the new Baltic arts complex and finishing on the lonely shores of Solway Firth, with its unique wildlife. To follow the Roman wall from coast to coast, all you need is this one book. Tour Hadrian's Wall. The Construction of Hadrian's Wall This is the first full account of all the techniques and skills needed to construct Hadrian's Wall, which is now scheduled as a World Heritage Site. Beginning with an examination of the surveying needed, the author goes on to discuss, quarrying and cranes, the transport of materials, whether by wagon or pack mule, and the amount of timber needed for scaffolding before explaining the method of burning lime for mortar and the techniques of putting one stone on another. The author argues that much of the construction work was relatively unskilled (being carried out by ordinary legionaries) and these low levels of skills suggest a relatively high rate of working. He makes an estimate of the size of the labour force involved in the Wall's construction. Life and Letters on the Roman Frontier: Vindolanda and Its People "Clodius Super to his Cerialis, greetings. I ask that you send the things which I need for the use of my boys... which you well know I cannot properly get hold of here..." So writes a Roman soldier stationed on the wild northern frontier of England around AD 100. In 1973, the first discoveries were made of the now famous wooden tablets, 300 letters and documents that had survived 2000 years, at the fort of Vindolanda. Painstakingly deciphered by Alan Bowman and David Thomas they have contributed a wealth of evidence for daily life in the Roman Empire. From the military documents we learn of the strength and activities of the units stationed at Vindolanda. The accounts testify to the lifestyle of officers and ordinary soldiers, with payments for pepper and oil, towels and tallow, boots and beer. Then there are snapshots of domestic life in letters between the officer's wives, including a birthday invitation. Most fascinating of all is the evidence for a high degree of literacy in the Roman army, when even a common soldier receives a letter from home promising him a parcel of socks. In this revised, expanded and updated edition, Alan Bowman's lively summary of this evidence is followed by the text of 50 key tablets, in Latin and in translation, bringing the reader very close to the actual people who inhabited Vindolanda in AD 100. Hadrian's Wall: Wall Country Walks Vol 2 For those who do not wish to follow the complete Hadrian's Wall walk, this volume contains 29 day walks incorporating small parts of the Wall walk into reasonable length circular routes. They range from starting points like Cherryburn in the east, to Bowness-on-Solway in the west. Tour Hadrian's Wall. The Roman Fort (Roman World S.) For more than 350 years the Roman Army maintained forts on Hadrian's Wall, as on all the other frontier zones of its huge empire. Excavations have now revealed what a typical fort looked like and how generations of soldiers lived, and died, to keep the Roman Peace intact. Birdoswald Roman Fort (English Heriatge Red Guides) At Birdoswald Roman Fort on Hadrian's Wall there are almost 2000 years of history to discover, from the Romans right up to the present day. This guide includes a tour and history of the archaeological site and surrounding landscape, plus full-colour maps, plans, eyewitness accounts and historic photographs. Hadrian's Wall (Penguin History S.) The authors of this book delved into the history of the Wall that ran from coast to coast, dividing Britain in two. Occasionally the Romans would march north and consider the complete conquest of the island; at other times the northern tribes would spill over Hadrian's Wall to pillage the Roman province. Despite this, for three hundred years, with very few lapses, the peace of the frontier was regulated by the troops along the Wall. Only when the Western Empire fell did the soldiers drift away and the Wall decayed. In their review of the evidence, the authors include details about the Roman army, its religion and daily bureaucratic life on the Wall. Hadrian's Wall: An Historic Landscape This text examines the impact of human activity in the area of Hadrians Wall, tracing the story from its Roman inception to the present day. The different elements of the wall's construction are considered alongside the role it has played in settlement, agriculture and the local economy. Tour Hadrian's Wall. Hadrian's Empire Hadrian's Wall is one of the world's best known legacies of the Roman Empire. It has stood for two thousand years as a moment to its creator, and yet he himself remains an enigmatic figure. Now bestselling author Danny Danziger and Nicholas Purcell reveal the details of the extraordinary life of this mysterious man, and the age in which he lived and ruled. Hadrian was Spanish, and a restless, inquiring intellectual. He travelled constantly and spent much time in cultural centres like Athens and Alexandria. Although he was not warlike, he was a good soldier, and was comfortable mingling amongst all ranks. And yet his personal life was a complicated one, rife with scandal and conflicted sexuality. This complex character was also responsible for some of the world's most enduring architectural treasures. He built the Pantheon in Rome, the largest dome built using pre-industrial methods and a sprawling 900-room villa at Tivoli with a towering 'pumpkin dome' - a fittingly idiosyncratic memorial to this most unusual of emperors. Northumbria and Hadrian's Wall (Ordnance Survey/AA Leisure Guides) This guide to Northumbria and Hadrian's Wall is part of a series which provides full A-Z information on an area of Britain, and presents ten walks, two car tours, plus information for cyclists. Tour Hadrian's Wall. Rome's Northern Frontier AD, 70-235: Beyond Hadrian's Wall (Fortress S.) The Roman excursions north of the Tyne-Solway line, the route of Hadrian's Wall, can be roughly divided into three main periods. Firstly, Agricola advanced against the Caledonii for six campaigning seasons culminating in the decisive battle of Mons Graupius in AD 83. Secondly, the Antonine Wall was built 70 miles to the north of Hadrian's Wall along the Forth-Clyde isthmus, though it marked the northern frontier of the empire for little more than 20 years. Finally, at the beginning of the 3rd century AD L. Septimius Severus arrived to restore order along the northern frontier, briefly reoccupying and repairing sections of the Antonine Wall. This title describes the fortifications left behind by each of these three attempts to subdue Rome's northernmost frontier. Tour Hadrian's Wall. Hadrian's Wall Gallery. Hadrian's Wall was a Roman frontier built in the years AD 122-30 by order of the Emperor Hadrian. It was 73 miles long and ran from Wallsend-on-Tyne in the east to Bowness on the Solway Firth in the west. Housesteads Fort stands on Hadrian's Wall - a defensive frontier that runs from Wallsend-on-Tyne to Bowness-on-Solway. The Roman wall built across Scotland almost 2,000 years ago could be awarded World Heritage site status.. The Antonine Wall runs from Bo'ness, near Falkirk to Old Kirkpatrick in West Dunbartonshire.